The ANO International Organ Festival begins its 2018 events under the overall umbrella title ANO Spring [Gr: ANO Aear]. Organist Eleni Keventsidou, soprano Marina Theodoropoulou, and mezzo-soprano Ioanna Vassiliki Koraki will perform works by Bach, Händel, Dvořák, Saint-Saëns, Faure, Reger and Schumann. 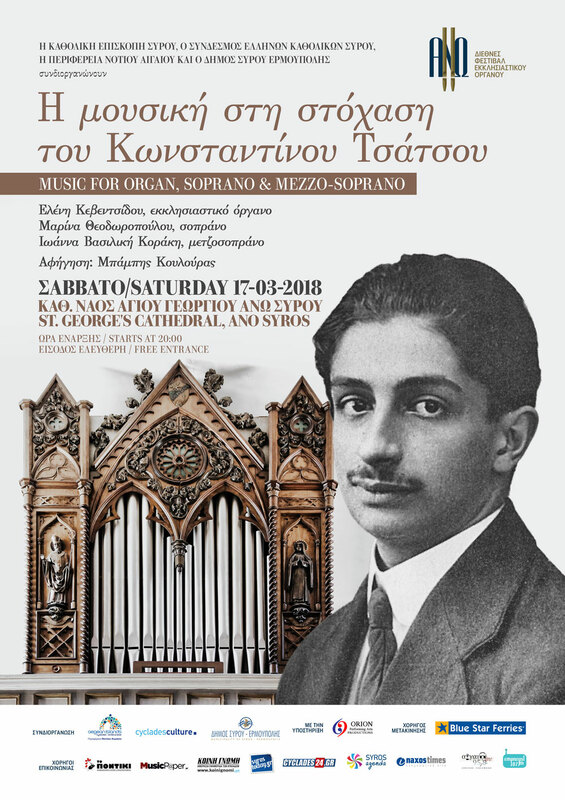 During this special Festival event under the title “Music in the Contemplations of Konstantinos Tsatsos”, Babis Koulouris will read excerpts from the autobiography of the unforgettable writer, poet, scholar, and President of the Hellenic Republic Konstantinos Tsatsos who had studied organ music in his youth on the very organ housed today in St. George’s Cathedral, Ano Syros.